Zayn Malik heats up the stage with red lights at his album release party held at the Honda Stage inside the iHeartRadio Theater in New York City on Friday (March 25). 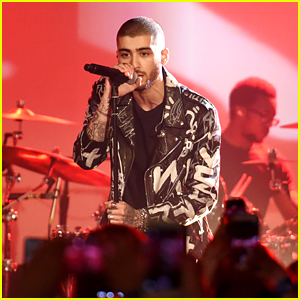 The 23-year-old singer kicked off the party for his solo album, Mind of Mine, with a packed crowd of fans and girlfriend Gigi Hadid. During the event, Zayn performed “Truth”, “It’s You” and “Like I Would”. On their way to the theater, Zayn and Gigi were kind to a fan who had been pushed over and helped her back to her feet. Andrew Garfield Reveals The Thought Of Exploring Fatherhood Is Both 'Exciting' AND 'Scary'! These Stars Have The Biggest, Sexiest Lips In The Biz! Stores Open Easter 2016: Walmart, Costco, Target, Kroger, Walgreens — Is Everything Closed Easter Sunday? Tori Kelly Kicks Off 'Unbreakable Tour' – See Set List & Photos!